Hello again! It's Annie, Hope's sister. Now that Hope is back from London I'm trying to spend as much time as possible with her! I love hearing all about her European adventures, but I have to admit that I sometimes get a bit jealous. So the only logical thing to do in my opinion is eat like we're in Europe while I listen to her stories about actually being there. 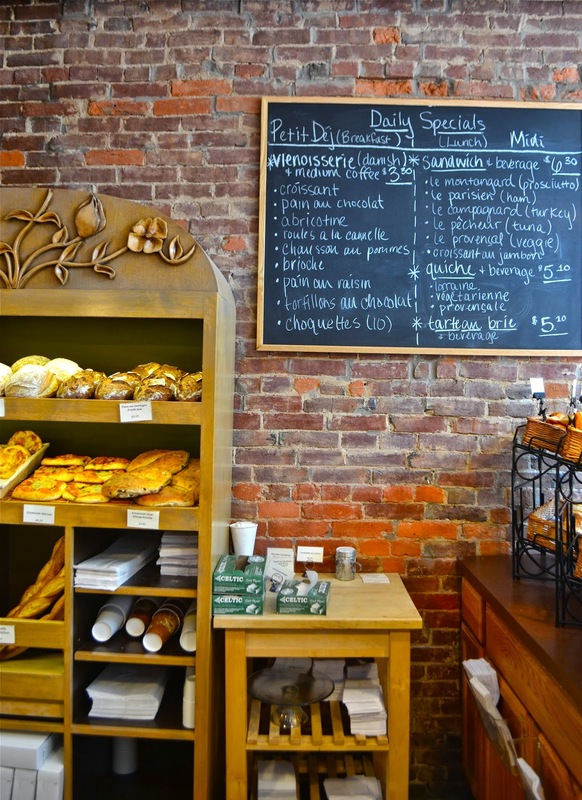 Our first stop, La Gourmandine Bakery in Lawrenceville just a few minutes east of Downtown Pittsburgh. My first trip to this bakery was in 2011. Instantly, I fell in love. It's just a tiny store, with only a few tables for two. I ordered pastries for my second wedding anniversary party (they were to die for and got so many compliments!) and while there had a baguette that honestly made me forget that I was in Pittsburgh instead of my favorite hole in the wall sandwich shop on Rue Saint Andres Des Arts in Paris. I've been meaning to take Hope there for quite some time, and when our lunch plans fell through at another place in Lawrenceville, La Gourmandine popped into my head. So we walked in and again I fell in love. It's just so cute inside and has such warmth, which probably comes from all the freshly "hand-crafted and baked" pastries, breads and desserts. We each got a ham sandwich (why don't I always put butter on a ham and cheese sandwich? It's perfection.) and decided to split a Marquise, which is a chocolate mousse, creme brulee and caramel masterpiece. I didn't know how to eat it and asked for a fork and the owner said it's like a candy bar and I should eat it with my hands. If that's a candy bar then I want to go there on Halloween. So good! Even my six-month old Jack got in on the action! We just started letting him eat solid foods and lucky for him he got to try out a Chouquette, very different from the avocados and bananas he is getting used to! The light and fluffy pastry was perfect for his little grip. While most of it ended up on the floor and table, he seemed to enjoy it! The owner was so sweet to give it to him to try and then she insisted we take a few more home for courage, as I told her we had a pediatrician appointment later in the day to get a couple shots! So for a brief moment on a Wednesday afternoon, Hope and I felt like we were in France, enjoying each other's company and laughing at Jack discover new foods. I love that Pittsburgh can make us feel like we escaped to a new place, all while still letting me drive my minivan to the pediatricians an hour later. ps. Check out Hope's adventure in Paris, visiting famed sweet spots, Laduree and Pierre Herme. And take a look at her eats in Rennes, France!